The Space Program celebrates its first showcase Thursday, April 25 at ACM@UCO Performance Lab, 329 E. Sheridan Ave., in Oklahoma City. Doors open at 7 p.m. and showtime is 7:30 p.m. Admission is only $5 at the door! Learn more at acm-uco.eventbrite.com. Come out and support the collective as they put on not just a dope show, but a dope experience. Merch also will be available. 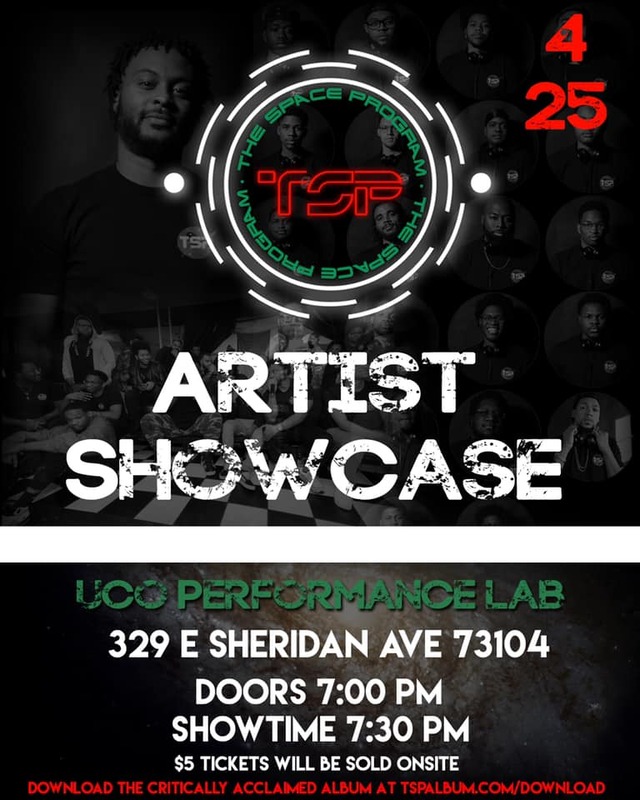 Formed in 2017, The Space Program (TSP) is a Black collegian hip-hop collective from higher education institutions across the state of Oklahoma. It creatively disrupts anti-Black, anti-Semitic, imperialist, white, patriarchal institutions that oppress Black people, through the creation and production of a hip-hop album, Curriculum of the Mind. The Space Program Collective sonically, empirically and ingeniously provides a new “Space Program” for hip-hop scholarship and praxis, both in the academy and the community at large. The Collective additionally provides for a community of Black males that currently attend, have graduated, or stopped out at historically white colleges within the past 10 years, who also identify as artists, rappers, musicians, producers, poets, activists, b-boys, disc jockeys (DJ’s), audio engineers, historians, entrepreneurs, graffiti artists, graphic and web designers, campus leaders, scholars, photographers, videographers and/or hip-hop collegians. New generations call for new voices, and new areas of inquiry, and this is your notice that class is in session. For Dr. View and the Space Program Collective, it always has been. 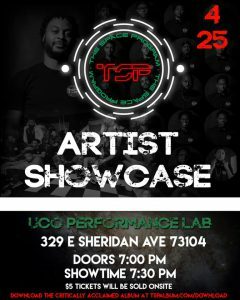 THE SPACE PROGRAM collective hosts its first showcase 7 p.m. April 25 at ACM@UCO Performance Lab, 329 E. Sheridan Ave., in OKC. Cover is $5 at the door! 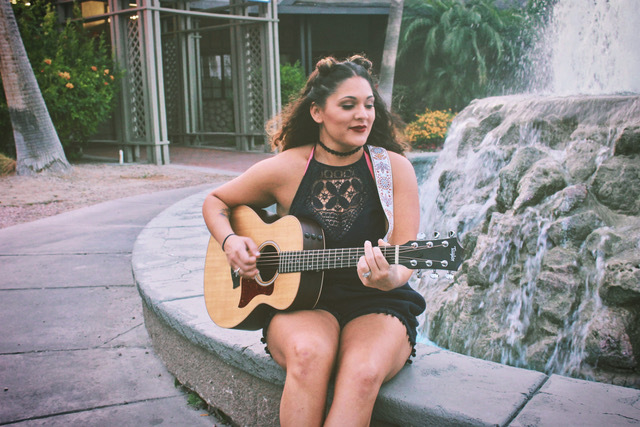 “Breathless” by Chloe-Beth Campbell, “Angels Lullaby” by Ashliann Rivera, “Abilities” by Dallas Parker (Faux Draco) and “Hollyhocks and Morning Glories” by Scott Aycock were recently selected from 74 entries as finalists in the second annual Jimmy LaFave Songwriting Contest. Three of the four finalists are students at The Academy of Contemporary Music at the University of Central Oklahoma (ACM@UCO). Finalists will play their songs before a live audience at an April 30 Gypsy Café pre-party hosted by the Red Dirt Rangers at Iron Monk Brewing, 519 S. Husband in Stillwater, according to the Tulsa World. Campbell is an ACM@UCO student from Enid, and released her debut full-length album, Remnant, last year. 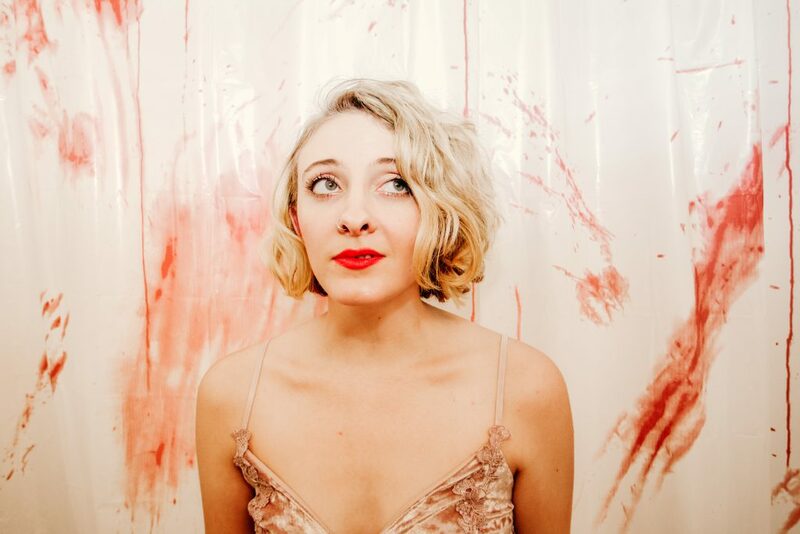 Rivera is a singer-songwriter born in Brooklyn and raised in Oklahoma City. She has released three EPs in the last three years. Parker, who performs under the name Faux Draco, is a rapper from Oklahoma City. Aycock is a longtime Tulsa singer/songwriter and poet who co-hosts NPR’s Folk Salad. At stake for the finalists is the chance to secure a spot in the lineup at Bob Childers’ Gypsy Café on May 1 and a $500 cash prize plus a $500 donation made in the winner’s name to the Red Dirt Relief Fund, according to a press release. A $100 “People’s Choice” prize will also be awarded by a vote of those in attendance. This event is free and open to the public. Swedish folk singer and songwriter Kristian Matsson, aka The Tallest Man on Earth, performs a sold-out concert 7 p.m. April 27 at ACM@UCO Performance Lab, 329 E. Sheridan Ave., in Oklahoma City. BEFORE HIS CONCERT, the public is welcome to attend a free masterclass and discussion with Matsson, hosted by ACM@UCO Executive Director Scott Booker, 4-5 p.m. April 27 at the Performance Lab. No ticket required for the masterclass. Seating is first-come, first-served. Learn more and RSVP at acm-uco.eventbrite.com. Singer-songwriter and R&B/Americana musician Parker Millsap. 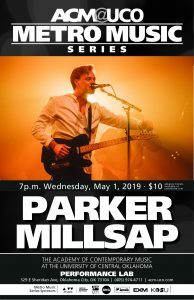 Oklahoma singer-songwriter Parker Millsap has quickly made a name for himself with his captivating live performances, soulful sound and character-driven songwriting. He performs a sold-out concert 7 p.m. May 1 at ACM@UCO Performance Lab, 329 E. Sheridan Ave., in Oklahoma City. BEFORE HIS CONCERT, the public is welcome to a free masterclass and discussion with Millsap, hosted by ACM@UCO Executive Director Scott Booker, 2-3 p.m. May 1 at ACM@UCO’s main campus at 25 S. Oklahoma Ave. (Songwriting Room, first floor), in Oklahoma City. No ticket is required for the masterclass. Seating is first-come, first-served. The events are part of the Academy of Contemporary Music at the University of Central Oklahoma’s continuing Metro Music Series celebrating the school’s 10th anniversary. Sam Weber, an indie singer-songwriter and musician from Victoria, British Columbia, returns to OKC for a concert 7 p.m. April 8 at ACM@UCO Performance Lab. Tickets are $10 at acm-uco.eventbrite.com. Weber is a singer-songwriter and multi-instrumentalist in the vein of Jackson Browne, The Band, The Wood Brothers and Gillian Welch. He has been touring independently and internationally with his band since 2013. Years spent refining songs at home in North Saanich, BC and working in studios in Los Angeles have honed Weber’s craft to a fine point. His live show pairs heartfelt songwriting with world-class musicianship and three-part harmony. He has released two LPs to date, “Shadows in the Road” (2014) and “Valentina Nevada” (2016). Through the characters and anecdotes in his songs, Weber sings about the truths of love, life and family. He and his band released a new EP, “New Agile Freedom,” in 2018 and are now on tour. ACM@UCO’s .WAV Festival celebrates women in music with two days of empowering music and performances, March 2-3 at the Academy of Contemporary Music at the University of Central Oklahoma (ACM@UCO) and its ACM Performance Lab in downtown Oklahoma City. Festival admission is free and open to the public, except for Sunday’s festival-headlining show by acclaimed Chicago hip-hop and spoken-word rapper Noname, who performs 8 p.m. March 3 at ACM Performance Lab, 329 E. Sheridan Ave. Elton and Original Flow & The Fervent Route open the show. 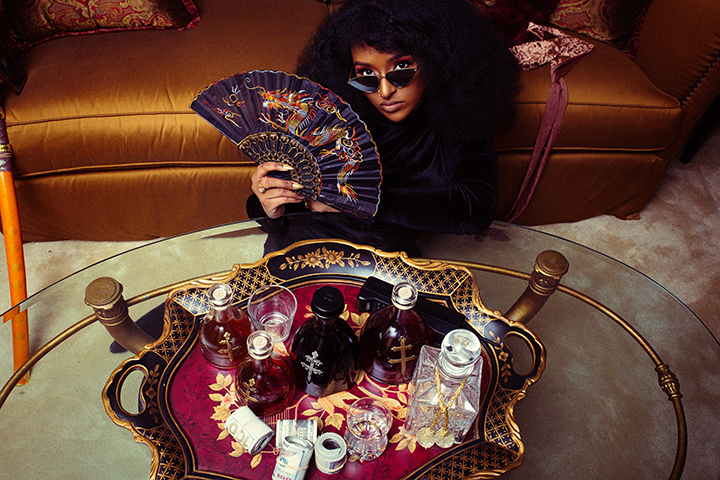 Tickets for the Noname concert are $25 and are sold out, although a limited number of tickets might be released for sale closer to the event date. Popular Americana sweetheart The Annie Oakley headlines the March 2 roster, performing a at 8 p.m. inside the Songwriting Room on the first floor of ACM@UCO’s main campus at 25 S. Oklahoma Avenue (first floor) in downtown Oklahoma City’s Bricktown entertainment district. The .WAV Festival features three indoor stages at two venues, with most performances happening 4-9 p.m. March 2 and 2-8 p.m. March 3 inside ACM@UCO. The lineup features Miillie Mesh, Ciara Brooke, Lauryn Hardiman, Creeping Toms, Ramona & The Phantoms, Me Oh My, Rozlyn Zora, Jade Castle, Michéla Creel and more. For more information, visit wav.eventbrite.com. Organized and run by members of ACM’s Women Audio Vision (.WAV) student organization, .WAV Festival showcases multiple genres and more than a dozen music acts performing grunge pop, Americana, blues, folk, singer-songwriter, rap and hip-hop and more. “.WAV Fest was created to empower women in the music industry,” said Katie Carmichael, student president of ACM@UCO Women Audio Vision (.WAV). “The event features bands with women and women solo artists, as well as dancers, artists and photographers. “The two-day event is also a food drive for Sisu Youth in OKC that helps homeless youth in the area,” Carmichael added. All .WAV Festival visitors are encouraged to donate nonperishable food items to benefit Sisu Youth Services, an Oklahoma City nonprofit organization that helps shelter and care for homeless youth living in our community. The mission of Sisu Youth, Inc. is to ensure that young people experiencing adversity have a safe place to sleep, the security to dream and the support to make a positive impact on the world. “We think .WAV Fest is important because not only are we representing ACM to show how vital the work they’re doing is in Oklahoma, but also to show how many women and female-identifying people are working in the arts in Oklahoma City to help shape the scene,” Carmichael explained. In fact, the student organization she leads, ACM@UCO Women’s Audio Vision, just began its second year on the school’s downtown campus. ACM@UCO’s Women’s Audio Vision group and the .WAV Festival is funded by the University of Central Oklahoma Student Association. As part of ACM@UCO’s Metro Music Series, the Noname concert is funded in part by the support of its sponsors, including Oklahoma Gazette, Exchange Music, KOSU Radio, Love’s Travel Stops & Country Stores, and the Oklahoma Arts Council, which receives support from the State of Oklahoma and the National Endowment for the Arts’ Art Works initiative. Find performance dates and times and learn more about the .WAV Festival at wav.eventbrite.com. The Annie Oakley headlines .WAV Festival with a free March 2 performance at ACM@UCO’s Songwriting Room (first floor), 25 S. Sheridan Ave., in Bricktown. Miillie Mesh performs Sunday, March 3 at ACM@UCO’s .WAV Festival. Kat Lock performs Saturday, March 2 at ACM@UCO’s .WAV Festival. Jade Castle performs Saturday, March 2 at ACM@UCO’s .WAV Festival. Eli Tostado performs Sunday, March 3 at ACM@UCO’s .WAV Festival. 4-9 p.m. March 2 and 2-11 p.m. March 3 at ACM@UCO campus and ACM Performance Lab. For more information, visit wav.eventbrite.com. Please note that the lineup is subject to change without notice. ACM@UCO Performance Lab, 329 E. Sheridan Ave.